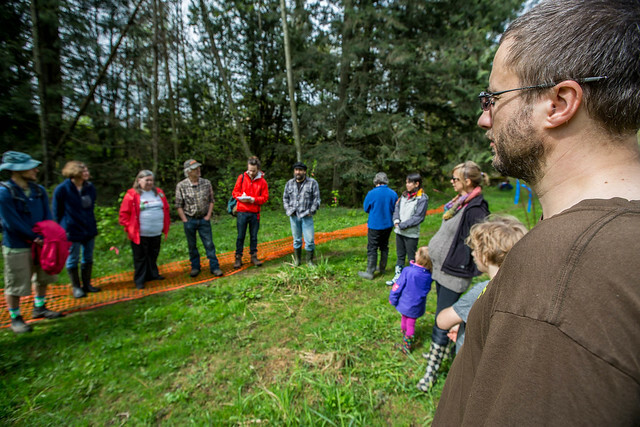 On April 23, 2017 the PIPE UP Network and friends took it upon themselves to replant trees in an area that Kinder Morgan had destroyed. The existing Kinder Morgan Pipeline crosses Sumas Mountain, and the proposed expansion is set to as well. Along the existing route Kinder Morgan has had a fierce battle with land owner Barbara, who has been holding them accountable for the destruction they've done. When it was obvious that Kinder Morgan was not going to properly restore the area they destroyed, home to rare species such as the Oregon Forest Snail, Barbara took it upon herself to do the work and PIPE UP stepped in to help out. Not only does this help the habitat but it is sure to annoy Kinder Morgan when they see we have been careful to follow the "rules" while also getting in their way, leaving a bright fence behind with the strong message of "stay out!". Planting in Protest from PIPE UP Network on Vimeo.